I went on my first agritourism progressive meal today. Let me just say, I’m now a big fan. Ann and I are attending the Plains Safaris: A conference on tourism and conservation in the Great Plains in Kearney, Nebraska, this week. When I saw that one of the pre-conference field trip options was an agritourism progressive meal involving two Nebraska breweries and a winery, I knew I’d found my happy place. The “Agritourism Progressive Meal” tour set off from the Younes Conference Center in Kearney at 8:30 a.m., and we had some ground to cover. 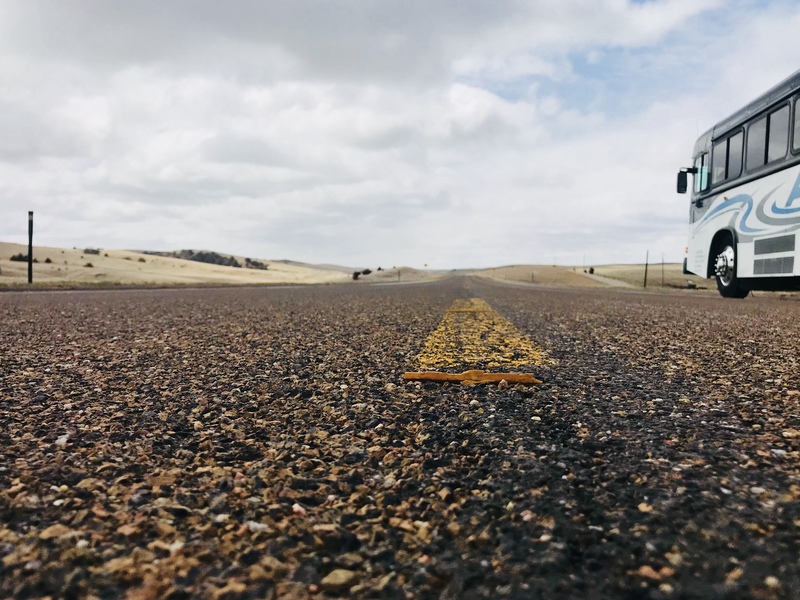 Folks who have visited Nebraska know that while there are tons of things to do, like THESE for instance, in this wonderful state, they may not be that close together geographically. 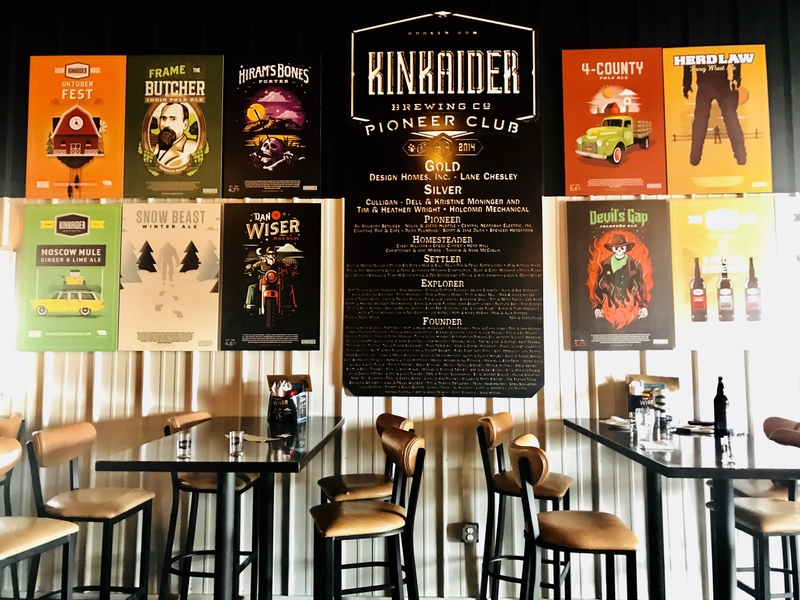 Our first stop was the Kinkaider Brewery in Broken Bow, some 65 miles north. We admired all of the unique beer bottle labels at Kinkaider Brewing Co. in Broken Bow, Nebraska. We passed the time on the bus introducing ourselves to other field trip attendees, and arrived at our first stop just in time to take part in a time-honored western Nebraska tradition after a road trip to the next town over, the mad dash to the restroom because of your morning coffee. 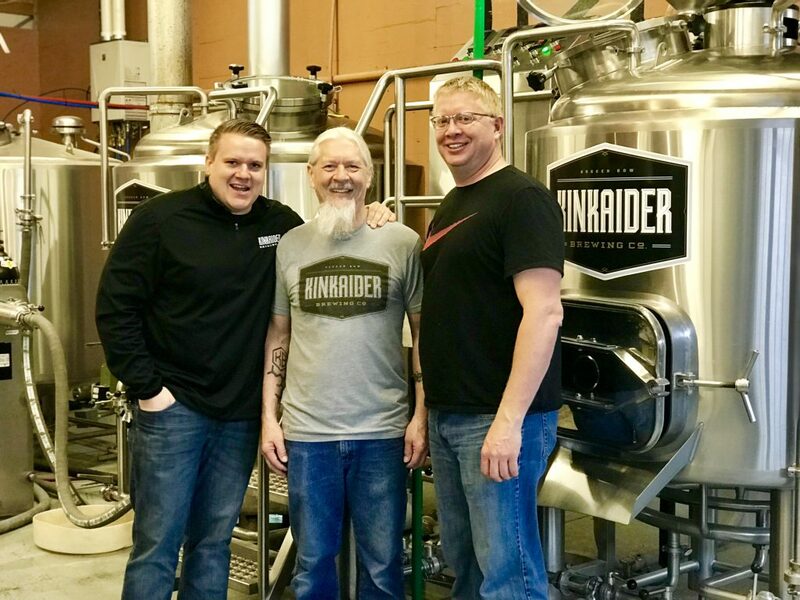 After that emergency was addressed, we toured Kinkaider Brewing Co. Founded by four Nebraskans whose families have been in the area for generations. They have truly incorporated the pioneer spirit into their business. During the tour we learned about how these friends have grown their business from the ground up, turning a hobby into a successful business that has its beer in 320 tap handles all across Nebraska. We tried several beers at Kinkaider Brewing in Broken Bow, Nebraska, including this Champion, paired with colossal shrimp with a jalapeño mango chutney. I really liked this tour because we learned a little about the brewery, then had an appetizer paired by the brewery’s new chef, Robert, with one of the unique beers they make. Then we’d do a little more tour, followed by another round of appetizers and a little more well-crafted beer. We spent 90 wonderful minutes at Kinkaider, and by the end of our time there had a solid grasp on their operation and had sampled four different appetizer beer combos. 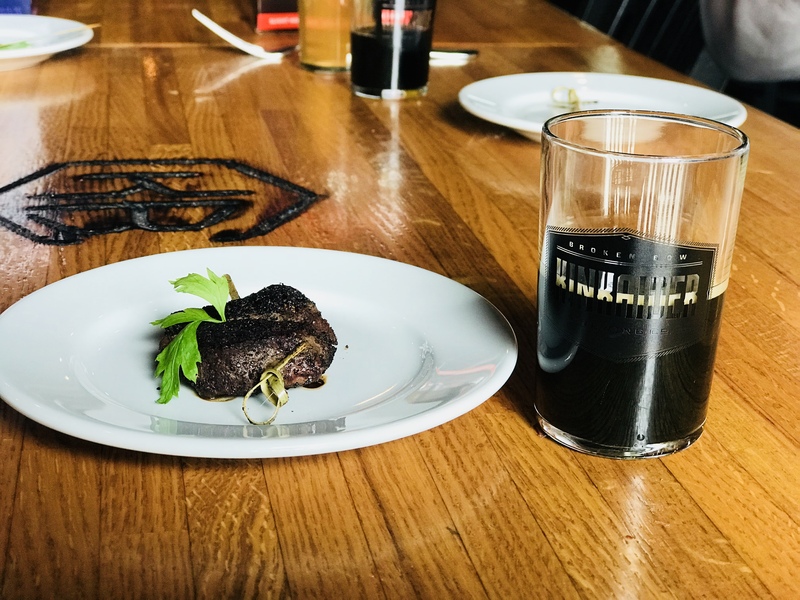 Food and beer pairing at Kinkaider Brewing Co. in Broken Bow, Nebraska. We hopped back on the bus, and drove about 60 minutes through the rolling Nebraska Sandhills, with one quick stop for a few photos of the beautiful hills. The view from the middle of the highway in the Nebraska Sandhills. Our next destination was Mac’s Creek Winery in Lexington. Of course, on arrival, we again took part in the western Nebraska bathroom dash because of all the delicious late morning beer in Broken Bow. 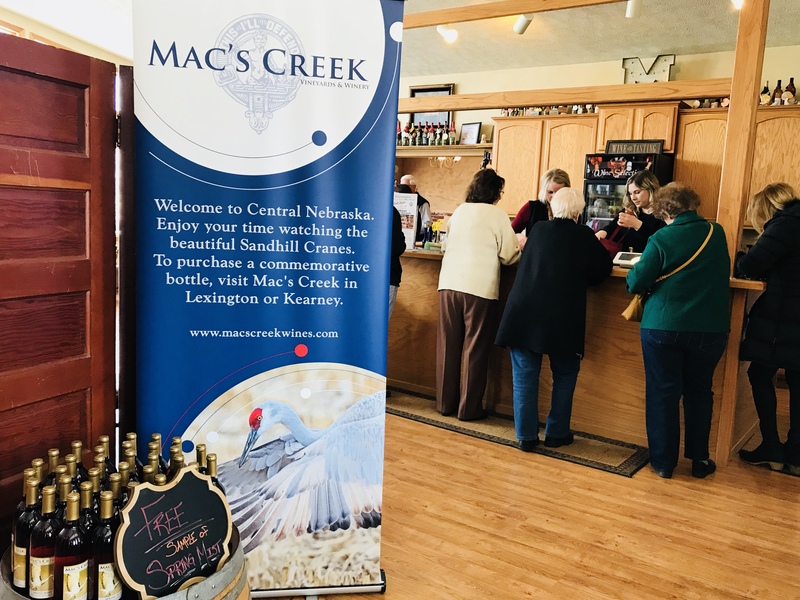 Mac’s Creek Winery in Lexington, Nebraska. A Nebraska leader in sustainable wine production, Mac’s Creek Winery strives to work with nature in creating their wines. They grow grape varietals that work in Nebraska which helps them reduce the amount of fertilizer and pesticide needed for their vines. As a result, they don’t have a Merlot or a Cabernet Sauvignon, but they do have wines made from Frontenac and LaCrosse grapes to name a few. 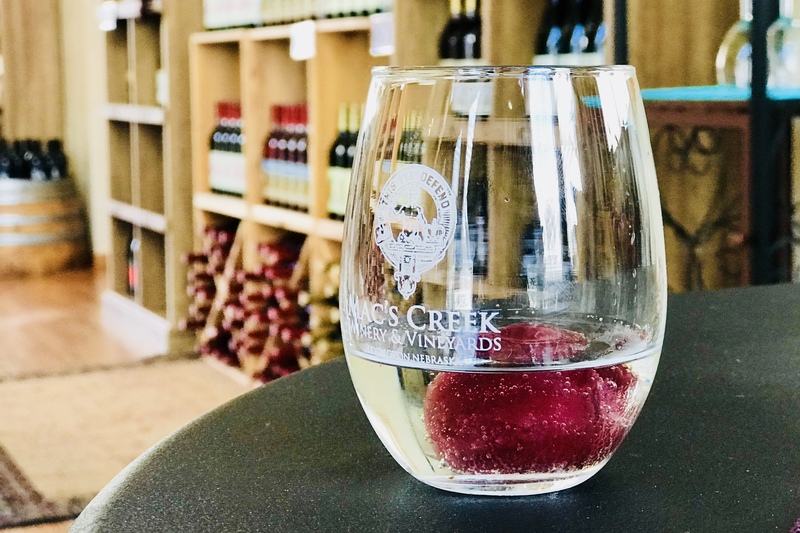 Arriving at Mac’s Creek, we first sipped a glass of hard cider, then sampled two whites while munching on cheese and crackers as we listed to the winemaker discuss the wine production process. From there, we sat down for a delicious lunch of chicken lasagna, bread and salad, paired with a larger glass of another wine of our choice. 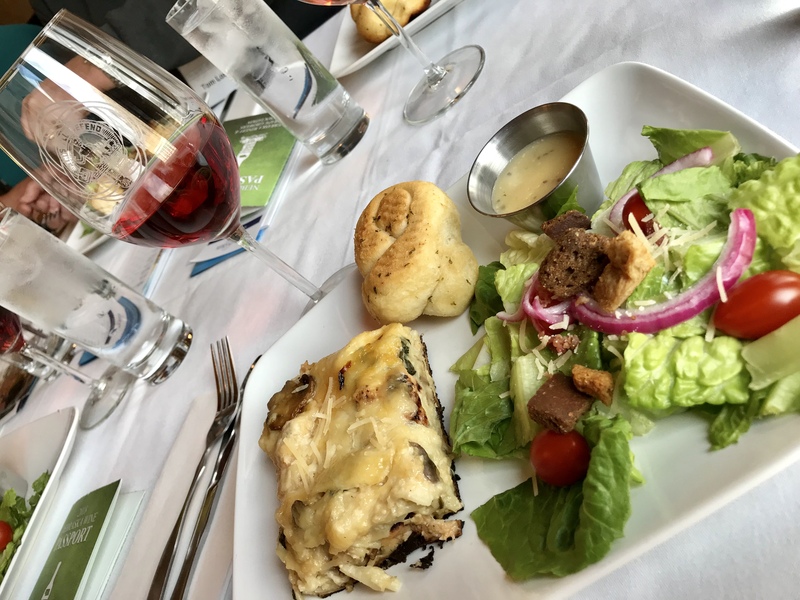 The chicken lasagna was paired with Mac’s Lantern dry Rose at Mac’s Creek Winery in Lexington, Nebraska. Ann and I both chose the Mac’s Lantern dry Rose, though many others went for the Buzzard’s Roost Blush, a semi-sweet blush wine. An amazing dessert of chocolate truffles and white chocolate mousse were served after, paired with a sweet white, a dry red, and a fortified wine. 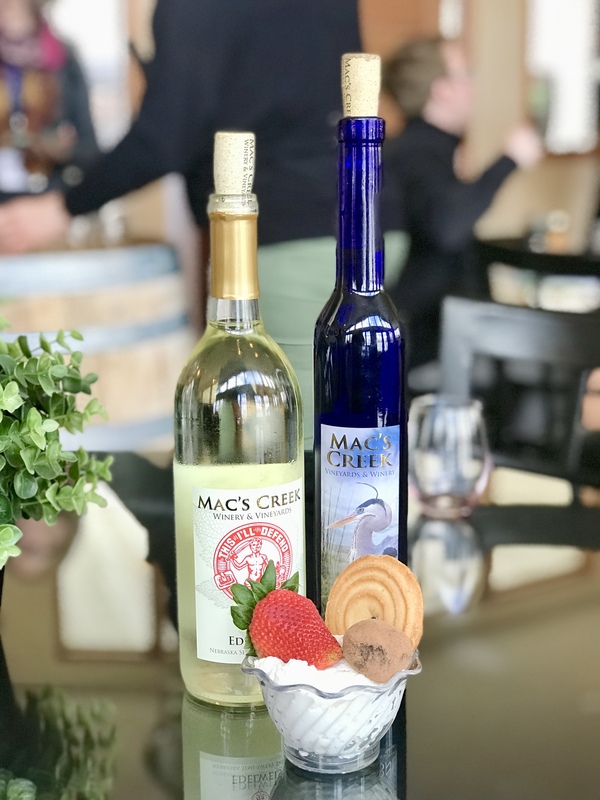 Mac’s Creek Winery in Lexington, Nebraska, served our final wines with a vanilla and white chocolate mouse and truffles. From Lexington, we hopped back on the bus and headed back east toward Kearney along the Lincoln Highway. There we wound up at our final stop for the day, the Thunderhead Brewery. 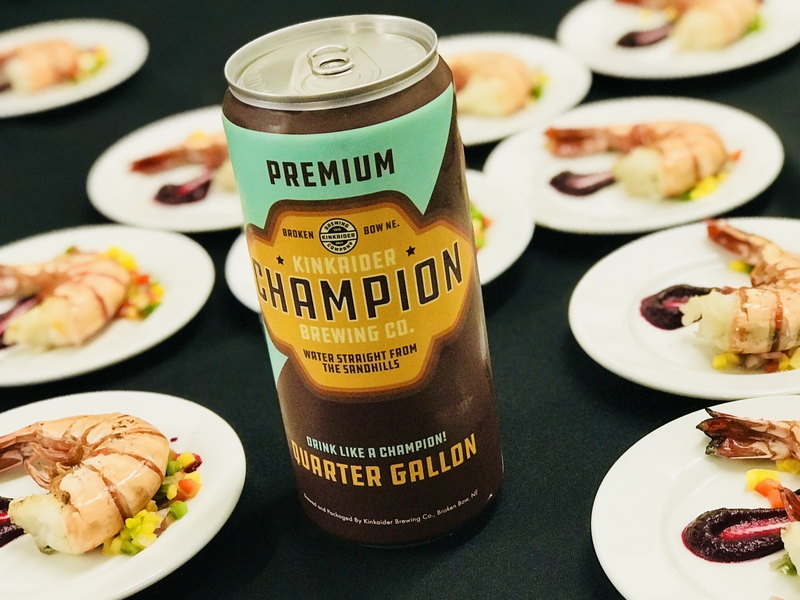 Owner and brewer Trevor Schaben rolled out the red carpet for our group and offered more than a half dozen beer options for sampling as well as stone oven pizza and breadsticks. 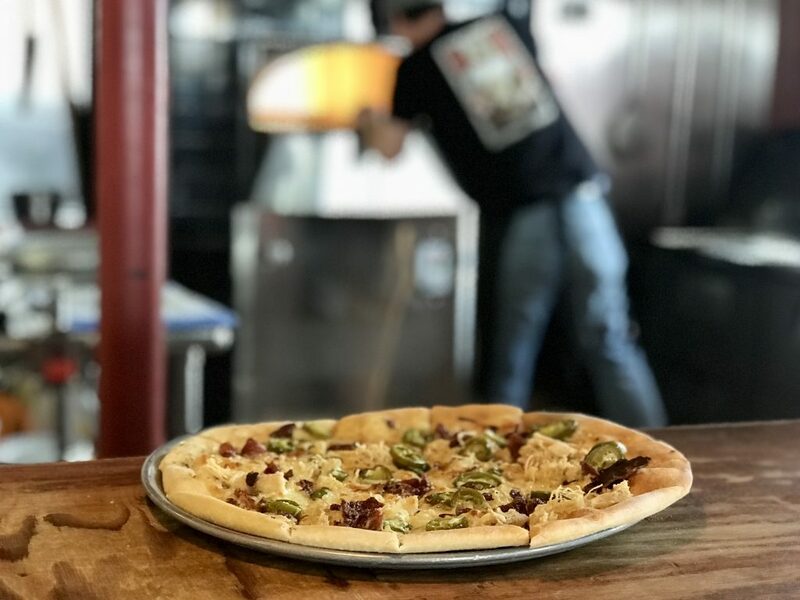 Pizza at Thunderhead Brewing in Kearney, Nebraska. All of their dough is made in-house. As Trevor points out, all their beer is homemade, so why wouldn’t the food be homemade, as well? 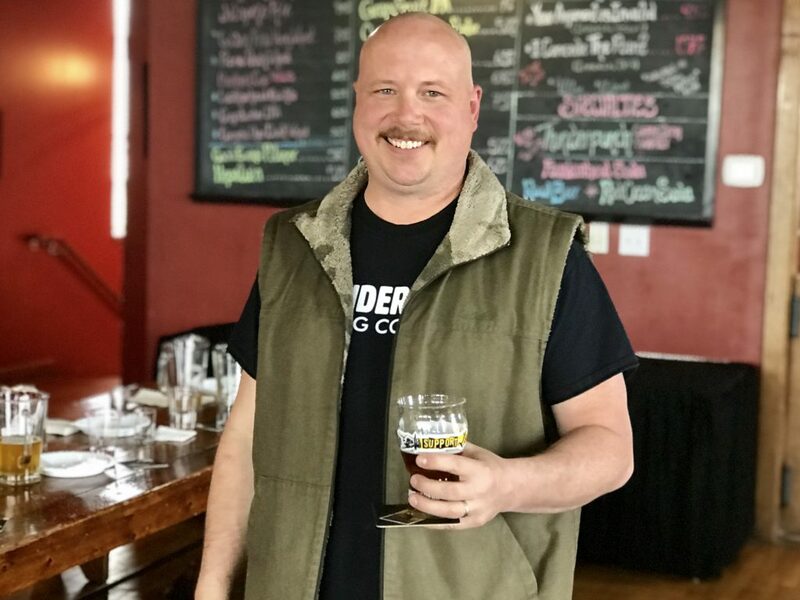 Trevor Schaben at Thunderhead Brewing in Kearney, Nebraska. Even though we were pretty full by this point, we decided we had to try these offerings. Not for ourselves, but for you, our readers. Let me just say that everything was absolutely delicious. I will definitely want to go back to Thunderhead Brewery the next time I’m in Kearney. 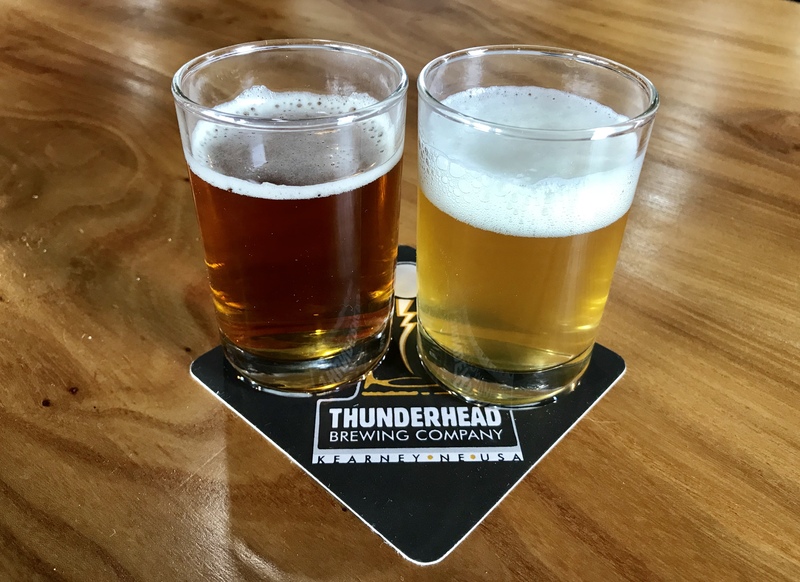 Beer at Thunderhead Brewing in Kearney, Nebraska. After three stops, four appetizer courses, lunch, dessert, breadsticks, and pizza, not to mention incredible beverages, we were more than satisfied. 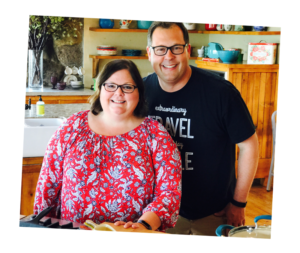 Like I said at the beginning of this post, I’m a big fan of agritourism and am thankful I live in a state where there’s plenty of it. Come see us sometime. This field trip experience was provided to us at a reduced rate. As always, the opinions expressed in this article are our own. What a wonderful post! I was out on the plains freezing my backside with the bison! What a wonderful time we all had and spending time with both of you was such a treat! Thanks, Suzanne. It was great to spend time with you, as well. Had so much fun following this progressive meal! Glad you enjoyed the tour, Jen. You’ll have to visit (and blog about) Western Nebraska someday.